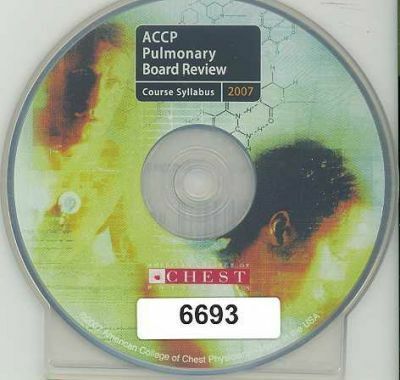 This book covers topics from the "ACCP Pulmonary Board Review Course 2007", offering a self-study resource to prepare for the subspecialty board examination in pulmonary disease. Pulmonary Function Testing: Salzman, S.H. ; Sleep in Lung Disease and Sleep-Disordered Breathing: Atwood, C.W., Jr.; Cardiopulmonary Exercise Testing: Salzman, S.H. ; Mechanical Ventilatory Support: Krieger, B.P. ; Asthma: Braman, S.S.; Chronic Obstructive Pulmonary Disease: Braman, S.S.; Other Pulmonary Disorders: Rosen, M.J.; Pulmonary Complications of Cardiothoracic Surgery and Trauma: Krieger, B.P. ; Hypoxemic Respiratory Failure: Rosen, M.J.; Ethics in Pulmonary and Critical Care Medicine: Krieger, B.P. ; Interventional Pulmonology: Krieger, B.P. ; Occupational Asthma: Beckett, W.S. ; Lung Diseases Related to High Altitude, Diving, and Near-Drowning: Krieger, B.P. ; Lung Cancer: Michael Alberts, W.; Pulmonary Complications of HIV Infection: Rosen, M.J.; Hypersensitivity Pneumonitis: Michael Alberts, W.; Eosinophilic Lung Diseases: Michael Alberts, W.; Hypercapnic Respiratory Failure: Rosen, M.J.; Pulmonary Fungal Infections: Sarosi, G.A. ; Pulmonary Vascular Diseases: Ryerson, G.G. ; Pleural Disease: Sahn, S.A.; Acid-Base Disorders: Zimmerman, J.L. ; Pleural Pearls: Sahn, S.A.; Hemodynamic Monitoring: Zimmerman, J.L. ; Community-Acquired Pneumonia: Advances in Management: Grossman, R.F. ; Unusual Lung Infection, Bronchiectasis, and Cystic Fibrosis: Ryerson, G.G. ; Hospital-Acquired and Ventilator-Associated Pneumonia: Grossman, R.F. ; Pathology of COPD, Asthma, and Organizing Pneumonia: Tazelaar, H.D. ; Symptoms of Respiratory Disease: Irwin, R.S. ; Pathology of Diffuse Lung Disease: Tazelaar, H.D. ; Uncommon Pulmonary Disorders: Prakash, U.B.S. ; Mediastinum: Prakash, U.B.S. ; Thoracic Imaging 2006: Naidich, D.P. ; Medical Statistics/Test-Taking Strategies: Kamp, D.W.; Lung Transplantation: Levine, S.M. ; Pulmonary Vasculitis and Alveolar Hemorrhage Syndromes: Prakash, U.B.S. ; Bronchoscopy: Prakash, U.B.S. ; Other Intrathoracic Tumors: Prakash, U.B.S. ; Rare Interstitial Lung Diseases: Pulmonary Langerhans Cell Histiocytosis, Lymph-angioleiomyomatosis, and Cryptogenic Organizing Pneumonia: Lynch, J.P.; Tuberculosis and Other Mycobacterial Diseases: Ashkin, D.; Idiopathic Pulmonary Fibrosis, Nonspecific Interstitial Pneumonia/Fibrosis, and Sarcoidosis: Lynch, J.P.; Drug-Induced Lung Diseases: Kamp, D.W.; Women's Issues in Pulmonary Medicine: Levine, S.M. ; Pneumoconiosis: Kamp, D.W.